» Another rail crossing to avoid? Another rail crossing to avoid? 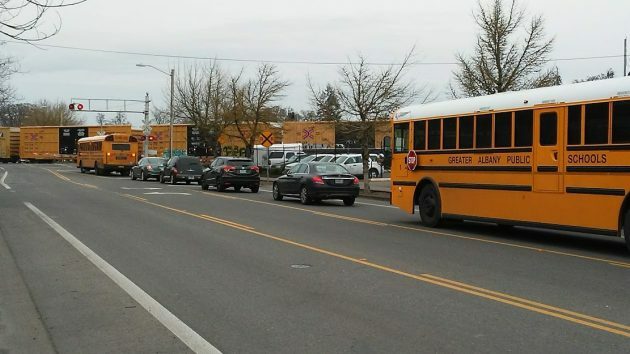 If Santiam Road on Tuesday is an example, the notorious Queen Avenue railroad crossing is not the only place in Albany where train operations sometimes cause long delays. On Santiam Road, a freight train on the Union Pacific main line and powered by UP locomotives blocked the crossing for about half an hour while an Albany school bus and dozens of other vehicles waited on the west side of the tracks. Drivers of other vehicles, including a second school bus, waited a short time but then took advantage of the Carriage House Plaza driveways and parking lot to turn around and head the other way. As the video above illustrates, a school bus was first in line at the crossing. The driver of the empty bus was Helen Jacobs. When I talked to her at about 3:10 p.m., she told me she had been waiting 11 minutes. She and others were stuck there another 20 minutes while the freight shunted back and forth a few times. Eventually, the freight started rolling north and cleared the street at about 3:30. The bus driver, who has served as head of the classified employees union in the Albany school district for 15 years, said this kind of delay has been happening there more frequently lately. From Santiam Road, we couldn’t see what was going on at the tail end of the train. But we assumed it was dropping off or picking up cars in the Albany yard nearly a mile to the southwest. 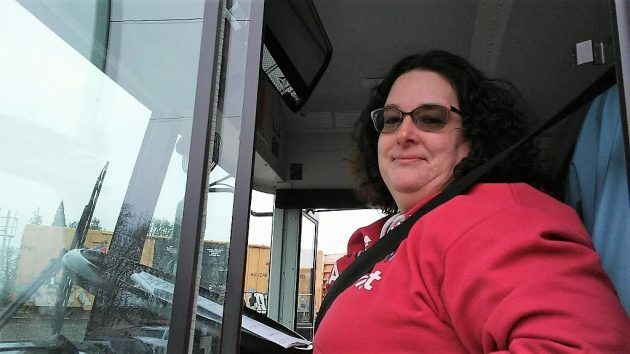 School bus driver Helen Jacobs had time to chat while waiting at the Santiam Road crossing Tuesday. A second school bus joined the queue before its driver turned into a parking lot to the left and headed in the other direction. If the City Council would simply mandate home-schooling, these sorts of challenges would go the way of the dodo. First, and foremost, the natural sound of the dry, squealing, piercing brakes on Hering’s video bacchanal serves as an inverse metaphor. As goes the battle between puny 4-cylinder, gas-powered engines and massive diesel-electrics…the masses struggling against the mighty overlords. A call to arms, perhaps? Given what Hering posits is more likely true than not, are there possible explanations for the increasingly annoying freight train-human interactions and are there any solutions amenable to the people who run things. Loved the use of video. Thank you, Hasso?